Gardening is one of the great pastimes. There’s something calming about tending to a garden, watching it grow, and reveling in its beauty. This time of year, the spring, gardening is something that many do because of the ideal weather. But, there are also types of gardening that can be done indoors that can bring the same joy, if not more as gardening outside. One of the most popular this year and last is the succulent garden. The definition of succulent plants is: plants that store water in leaves, stems, or both. There are many different types, species, and cultivars, all with a fascinating assortment of shapes, sizes, colors, and unique features that can range from frills to spines and beautiful flowers. Succulent plants are extremely hardy and require little attention. They can grow fast and reproduce to staggering sizes in no time. The makings of a succulent garden is quite easy. You’ll need a large dish, pot, bowl, or similar. This will actually house the succulents. You’ll then need some potting soil and some small rocks, like gravel, volcanic rocks, or the like. Then, of course, you’ll need succulents. 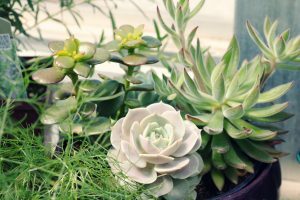 Because of their many variations, choosing can be the most difficult task of making a succulent garden. The key to creating a beautiful succulent garden is quite similar to creating a beautiful flower garden: variations in size, shape, and color. Begin with something tall, like aloe vera. Not only is this hardy plant low-maintenance, it can also provide a natural medicine. If you have a burn, superficial cut or abrasion, simply break off one the aloe vera leaves and use the sticky goop on the wound. It has a cooling effect that’s perfect for burns, as well as an antibacterial property to help reduce infection. Second in your garden, try something that sprawls out and covers a lot of surface. The succulent, Hen and Chicks, is perfect for this. One of the cool things about Hen and Chicks is their ability to spread. You can plant a single Hen and Chick and within a couple months it may cover your entire dish, with proper care, of course. Thirdly, go for something with color. Try the spindly succulent, Euphorbia Guentheri, also known as the Sausage Spurge. This towering plant will grow in numerous directions, filling in empty space in your bowl. It will also flower beautiful white flowers on the tips of the plant. You can also plant a succulent that’s known as the zebra plant. These long leaves are striped, much like a zebra. Now that you’ve got all your succulents in your bowl, give them some water and place them in a spot in your home that gets some sunlight. These plants can actually survive massive temperature shifts. After all, they are native to deserts, which get hot in the day and extremely cold at night. All that’s required is a once a month watering, give or take, and sunlight. Before you know it everyone in your senior living community will want to know how you created such a beautiful garden. When it comes to plants like the Hen and Chicks, you can literally pull up a single Hen and Chick and gift it to someone, who can then plant it with great success. We hope that you can find some solace in your new succulent garden and that it brings you years of joy.